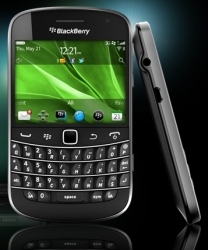 Research In Motion (RIM) has launched Blackberry Bold 9900 in India that comes with the Blackberry 7 operating system. The new phone is the thinnest Blackberry offering till date at a mere 10.5mm width and features both a touchscreen and a QWERTY keyboard. We had earlier written about the mobile phone when it was announced by the company. The BlackBerry Bold 9900 runs on Qualcomm's 1.2GHz Snapdragon processor, has 768MB of RAM and 8GB of internal storage which can be extended up to 32GB with a MicroSD card. It has a 2.8 inch capacitive touchscreen (640 x 480 pixel resolution) featuring RIM's Liquid Graphics technology and a pixel density of 287 dpi, a track pad and a full QWERTY keyboard. The mobile has a 5 mega pixel camera with auto flash which can also record High Definition videos at 720p, a feature absent in earlier models of BlackBerry. The device comes with brushed stainless-steel surround and a high-gloss glass-weave back plate. The inclusion of touch screens means you can use both the track pad and the screen for the functioning of the device. The new OS will also play an important role in improving the user experience since according to the company; it is a "performance driven" platform. BlackBerry 7 OS also supports augmented reality applications, has voice-enabled search and has NFC (near field communications) short-range high-frequency wireless communication technology for contactless credit card payments. To know more about Augmented Reality, read this post. The dimensions of the device are 115 x 66 x 10.5mm and it weighs at 130grams. The official price of the mobile phone is Rs.32,490 but you can get your hands on it for a thousand rupees less for Rs.31,199 at online shopping sited like HomeShop18. The company has announced a total of 7 new smartphones and in doing so is looking to regain its position in the market. In the recent times, the sales of RIM devices have decreased dramatically and the company hopes the new launches will improve the situation. "This is the largest global launch of BlackBerry smartphones in our history," said Mike Lazaridis, President and Co-CEO of Research In Motion. "We think the customers will be thrilled by the faster performance, enhanced browsing and richer multimedia delivered by these powerful new BlackBerry Bold and BlackBerry Torch smartphones."